Abner and Ian are stuck sideways in this clever picture book created by a bestselling, acclaimed author and cartoonist--and perfect for fans of Elephant & Piggie and Press Here. Abner and Ian are stuck sideways on the pages of their debut picture book. They can't start the story like this! Ian is trying to be brave, despite his dizziness and fear of heights. 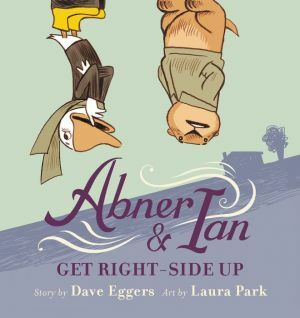 But don't worry, because Abner has a plan: Readers will shake and turn the book until they get right side up! Sounds easy, right? Think again, because the real solution may be the opposite of what you'd expect. With the odd couple wit of Elephant & Piggie, the interactive appeal of Press Here, and a timeless charm all their own, Abner & Ian offer readers of all ages eighty pages of fast-paced fun with a surprising and rewarding twist.